Organic kombucha, a delicious sparkling tea that's low in sugar and full of gut friendly live cultures - help your gut & love yourself. Gina developed a taste for kombucha after working in the US and started learning how to brew it herself when she returned home. After months of experimentation, and lots of different types of tea and ingredients, she created a range of flavours all brewed from her bedroom. Since then, with some help from a master brewer and her partner Luke, Wild Fizz has gone from strength to strength. 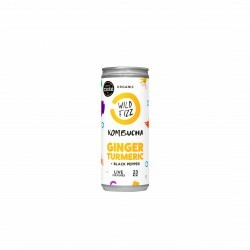 Their Organic Certified kombucha is very low in sugar, packed full of probiotics, healthy enzymes, acids and vitamins, and most importantly tastes great! This is because it's made only with the finest 100% natural ingredients, and handcrafted with love by Gina & Luke in their state of the art brewery.